Detailed Description: Schneider Electric/Square D PowerPact® HGA 3-Pole Molded case circuit breaker has H-frame. It provides thermal magnetic protection and has I-line style plug-in type connection. It has a trip rating of 900 - 1700 Amps. It has a current rating of 125 Amps and voltage rating of 600 VAC, 250 VDC. It provides protection from overloading and short circuit. ABC-Phase circuit breaker has interrupting rate of 18 kilo-Amps at 600 VAC, 20 kilo-Amps at 250 VDC. It can accommodate aluminum/copper wires of size 14 - 3/0 AWG and has line/load side lug for convenient connection. It measures 4.120 Inch x 3.440 Inch x 6.400 Inch. 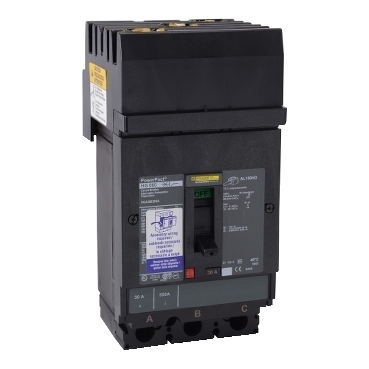 Circuit breaker is UL listed/CSA certified/IEC rated and meets NOM/Fed. Specs W-C-375B/GEN standards.